Did you know that this film is so British funny, that in 1989 it killed a man from Denmark? Ole Bentzen was his name, and he literally laughed himself to death during the scene where chips got stuffed up a stuttering mans nose. Sad but true story I'm afraid to say. Unlike this film Directed by Charles Crichton; and Starring: John Cleese, Jamie Lee Curtis, Kevin Kline and Michael Palin. It was made in 1988 and lasts for 104-minutes. Two American con-artists, Wanda Gershwitz and Otto West (Jamie Lee Curtis and Kevin Kline), thought that they come up with the perfect plan. Step One: Team up with British bad-guys, George Thomason and Ken Pile (Tom Georgeson and Michael Palin), and steel some diamonds from the London Diamond Exchange. Step Two: Double cross George, and secretly have him arrested by the police. Step Three: Retrieve the stolen diamond from George's hidey-hole, and then get away from England Scott Free. Now I am sure that this sounds like a pretty straight forward plan, don't you agree? However, just prior to George getting arrested, he somehow manages to hide the diamonds in an unknown location, so when Wanda and Otto go and swipe this stolen loot - ooops - panic stations! OK, so what can they do to rectify this situation, huh? Coerce stuttering Ken to tell them what George has done with their ill gotten gains? No. Not happening. He does not know where the diamonds are anyway. Plus he has his hands full at the moment, trying to kill off a witness who can identify George. Well, what about that key George gets Ken to hide away for him then? Does that have any relevance at all? Nah! It's useless unless they know what it unlocks. Although Wanda does get her hands on it and hides it upon her person. Oh! I know. What about George's legal council, Archie Leach (John Cleese)? Maybe Wanda can use her womanly ways to get him to find out where George has hidden the diamonds? Hmm. No. Afraid not. He's married. He's British. And he is not allowed to speak to Wanda because she is associated with George's case. Nonetheless, you know what they say about a woman on the prowl, right? Therefore, on numerous occasions, Wanda charms her way into Archie's affections, and at each time, something strange, bad, and bizarre happens to them both. Strange; because both the barrister and the con-artist get closer and closer together. Bad; because Otto and Archie but heads - literally - causing friction and descent to all in sundry. And bizarre, because... oh... that's too damn difficult to explain! Let me just say that what next transpires really kicks off when an apology leads to a parting of ways. As crooks turn on crooks - lawyers don't play by the books - a fish is mercilessly swallowed - and revenge is something that can never truly be followed. 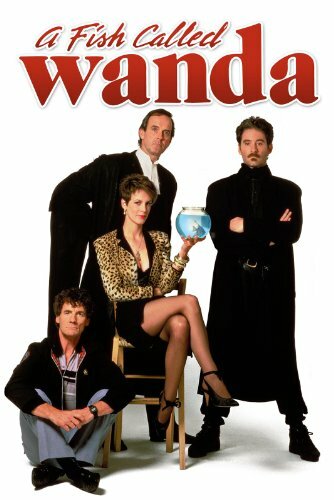 Now in my own personal opinion, 'A Fish Called Wanda' is a film without any flaws in it what so ever. OK, so maybe one flaw. The whole love-story scenario between the characters played by John and Jamie did come across a mite sparse in the execution. But apart from that - pow - perfectamundo mon cap-i-tan. You see, from my own personal perspective, I find that this movie is able to amalgamate so many different characters elements together -- so well -- that you can hardly see the seams that fit the 'smaller parts' within the 'whole' (please excuse the visual imagery). For example: (1) John Cleese's character of Archie is the everyman in this piece. He is the chap who is in a loveless marriage and in a stuffy profession, yearning to break free from the shackles of the mundane. You hardly see John over act in this film. If anything, his performance is rather understated for the majority of the time. (2) My God. Jamie Lee Curtis. What a fox she is. To me she is the spark of dangerous hope that every middle-aged man secretly desires, but can never seem to grasp in reality. Moreover, she plays the part of Wanda with such charm and elegance, that I almost forgot she was in essence the 'bad guy' in this film! (3) If ever Monty Python had an American branch of their troupe, Kevin Kline would surely be a member of it. Honestly, through out this picture Kevin literally channels his inner John Cleese, and is able to make Otto a silly, brash, and bold idiot if ever I saw one. Just don't call him stupid, ha! (4) As ever with Michael Palin, he pulls something out of the bag without it appearing disrespectful at all. I am sure that if a lesser comedian performed his role of Ken, his stuttering antics could have come across as crass and cheep to say the very least. Not to Michael. Hey! Do you know what? While I am in a bullet point mood, please check out these filmic facts: (1) When this film was released, Michael Palin founded the 'London Centre for Stammering Children', because a group of stutterers applauded him for his performance in this picture. On a side note, Michael's father had a stutter too. (2) The name of John Cleese's character, Archie Leach, is the real name of actor, Cary Grant. Many a year ago John was brought up about twenty miles away from where Cary once lived. (3) This was director, Charles Crichton's, last film. He also famously made 'The Lavender Hill Mob' as well. (4) Archie's daughter is played by John Cleese's real daughter, Cynthia. 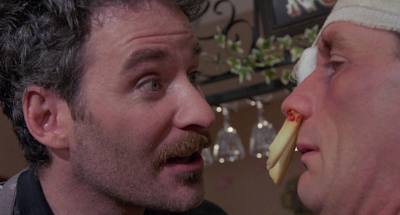 (5) The fish that Kevin Kline ate from the fish-tank is made out of jelly. Kevin wanted to eat a real fish though. (6) Just like Basil and Sybil in the sit-com 'Faulty Towers', Archie and Wendy also sleep in separate beds. (7) On the call sheets, Jamie Lee Curtis was listed as 'Jamie Lee Schwartz', because John Cleese found it funny that her father, Tony Curtis, real name was 'Bernard Schwartz'. (8) John Cleese studied law at Cambridge University, but never actually joined the bar. (9) The interior for the 'friends flat' belonged to Nicholas and Juliet Lacey, and was located in Reeds Wharf, Docklands, London. (10) This film was enormously successful when it was released. Kevin Kline won an Academy Award for best supporting actor. John Cleese and Charles Crichton received an Academy Award nomination for best original screenplay. Jamie Lee Curtis got nominated by the Golden Globes and by BAFTA for leading actress. And Michael Palin won a BAFTA for the best supporting role. Do I have to say any more than that? Huh? Overall 'A Fish Called Wanda' is a classic slice of British cinema, and is up there with all of the other great Python related comedies (click here for the Python section). My own favorite section of this film is the last twenty minutes or so, because I felt that the overall piece shifted gear, and delivered in providing a great conclusion to a great film. Also, all of the scenes where people moved were very good too. Wouldn't you agree John? Fair enough. Now piss off.